"They're clever scoundrels," fumes John Shepherd-Barron at his remote farmhouse in northern Scotland. He is referring to the seals which are raiding his salmon farm and stealing fish. "I invented a device to scare them off by playing the sound of killer whales, but it's ended up only attracting them more." But failure with this device is in contrast to the success of his first and greatest invention: the cash machine. 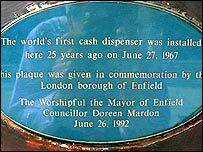 The world's first ATM was installed in a branch of Barclays in Enfield, north London, 40 years ago this week. 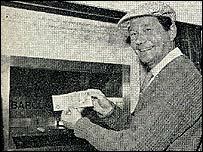 Reg Varney, from the television series On the Buses, was the first to withdraw cash. Inspiration had struck Mr Shepherd-Barron, now 82, while he was in the bath. The machine detected it, then matched the cheque against a Pin number. However, Mr Shepherd-Barron denies there were any health concerns: "I later worked out you would have to eat 136,000 such cheques for it to have any effect on you." The machine paid out a maximum of £10 a time. "But that was regarded then as quite enough for a wild weekend," he says. To start with, not everything went smoothly. The first machines were vandalised, and one that was installed in Zurich in Switzerland began to malfunction mysteriously. It was later discovered that the wires from two intersecting tramlines nearby were sparking and interfering with the mechanism. 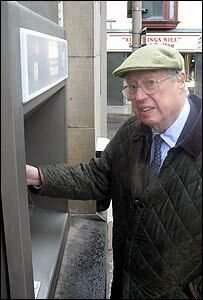 Customers using the cash machine at Barclays in Enfield High Street are mostly unaware of its historical significance. A small plaque was placed there on the 25th anniversary, but few people notice it. Given that there are now more than 1.6 million cash machines worldwide, it is a classic case of British understatement. Mr Shepherd-Barron says he and his wife realised the importance of his invention only when they visited Chiang Mai in northern Thailand. They watched a farmer arriving on a bullock cart, who removed his wide-brimmed hat to use the cash machine. "It was the first evidence to me that we'd changed the world," he says. But even though he invented the machine, Mr Shepherd-Barron believes its use in future will be very different. He predicts that our society will no longer be using cash within a few years. "Money costs money to transport. I am therefore predicting the demise of cash within three to five years." He believes fervently that we will soon be swiping our mobile phones at till points, even for small transactions. At 82, Mr Shepherd-Barron is very much alive to new ideas and inventions - even though his device that plays killer whale noises still needs a little bit of tinkering.